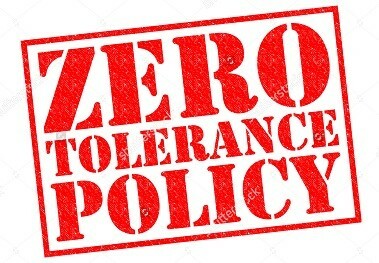 To help prevent physical assault and verbal abuse during sanctioned events Plainview Old Bethpage Soccer Club (POBSC) has adopted a ZERO TOLERANCE POLICY. This policy applies to all coaches, players, parents, spectators and other supporters and referees effective immediately. Abusive and obscene language, violent play/conduct, fighting and other behavior (including, but not limited to sarcasm, taunting, etc.) deemed detrimental to the game will not be tolerated. The ultimate responsibility for the actions of coaches, players and spectators resides with all POBSC member clubs. It is the responsibility of the coaches to provide referee support and spectator control, and it is the responsibility of the POBSC member club to provide instructions to their coaches on how to implement sportsmanlike behavior. Remember: the referee does not have to show a yellow card before showing a red card. The referee may issue a verbal warning to the coach of offending party's team. The conduct of the players is governed by the Laws of the Game as stated by FIFA and USSF. The Laws themselves describe penalties associated with violating the Laws of the Game. In severe cases of unsporting behavior and violent conduct players will be called into a hearing with POBSC Board of Directors supervisory committee with his/her coach and/or parents for further disciplinary action. A club may also be fined for such matters. A player called to a hearing that does not appear, will be suspended from play until such time of appearance. It is the responsibility of all coaches to maintain the highest standards of conduct for themselves, their players and supporters in all matches. Failure to do so undermines the referee's authority and the integrity of the game resulting in a hostile environment for players, the referee(s), coaches, assistant coaches, trainers and parents/spectators. As role models for all of the participants and spectators, coaches participating in a LIJSL, ENYYSA, SSI, 135, or USYSA sanctioned event are expected to be supportive of, and to acknowledge the effort, good play and sportsmanship on the part of ALL players from either team in a game. By example, coaches, assistant coaches and trainers are expected to show that although they are competing in a game, they have respect for their opponent, referees and spectators at all times. POBSC will not tolerate negative behavior exhibited either by demonstrative actions and gestures, or by ill-intentioned remarks, including those addressed toward the referees or members of an opposing team. Coaches exhibiting hostile, negative, sarcastic or otherwise ill-intended behavior toward referees, opposing players or coaches. NOTE: It is recommended that coaches or other team members do not engage in any conversation with the referee(s) once the game has concluded. The referee may issue a verbal warning to the offending coach, assistant coach or trainer. The referee may eject the offending coach, assistant coach or trainer. Once ejected, the individual will be required to leave the field immediately. The referee should abandon the game, if the coach, assistant coach or trainer does not leave the field or any immediate adjoining area after having been instructed to do so. Additional penalties associated with the ejection of a coach, assistant coach or trainer may be assessed by an POBSC. These penalties may be no less stringent than sanctions and/or fines as may be imposed by LIJSL, SSI, 135 or other leagues which POBSC teams play in. .
All cases of alleged assault of a referee shall be reported to the ENYYSA Office and State Referee Administrator within 48 hours of the match. POBSC will also conduct a verification of the complaint and subsequent actions and may at their discretion impose additional penalties to the coach, assistant coach and/or trainer.